RING - SARAH COVENTRY. "MOLTEN TOPAZ". MATCHES THE MOLTEN TOPAZ NECKLACE AND EARRINGS - BUT IT IS A REPURPOSED PIECE - SOMEONE MADE IT FROM AN OLD EARRING. TASTEFULLY DONE WITH A SARAH COVENTRY ADJUSTABLE BAND. 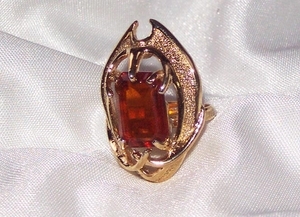 RING TOP IS 1 3/16" LONG. AGAIN - THIS IS NOT AN ORIGINAL SARAH COVENTRY PIECE. VERY GOOD CONDITION.